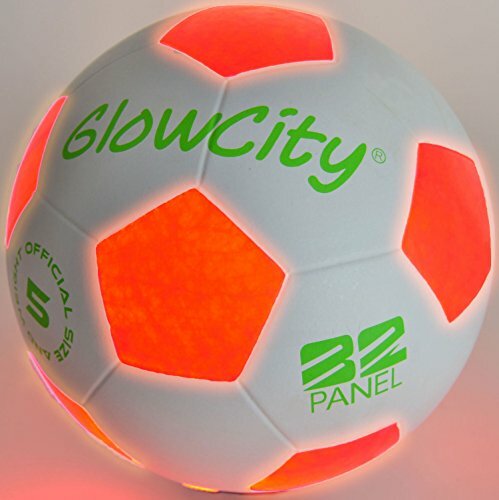 LIGHT UP SOCCER BALL SIZE 5: The GlowCity LED Soccer Ball can be seen a few hundred yards away. Making our nightball soccer ball a fantastic for those times when games run late. IMPACT ACTIVATED: Our Soccer Ball has a quality like no other. Unlike waiting for a glow in the dark soccer ball to charge under light our smart LED bulbs are instant! •SUPER BRIGHT: At night two Hi Bright LED's will fully illuminate the soccer ball into a magnificent Glow. Both intensely bright LED's are designed to fit inside the soccer ball. DURABLE QUALITY: Nylon wound, very strong soccer ball. Batteries are included as well as very easily replaceable. Our rubber grommets protect the LEDs to make the soccer ball fully water resistant.